Aluminum 2-in-1 Convertible Hand Trucks are used for Applications including Commercial, Industrial, Distribution, and more. Aluminum 2-in-1 Convertible Hand Trucks are made of high quality materials for long lasting durability and dependability. Trucks allow ergonomic content mobility and transport. Adjustable push handle converts unit from a Hand to Platform Truck. Includes wheels for convenient maneuverability. Available types are Full Pneumatic, Microcellular Foam, No Flat, Pneumatic, and Rubber. Styles are Gemini XL, Junior, and Senior. 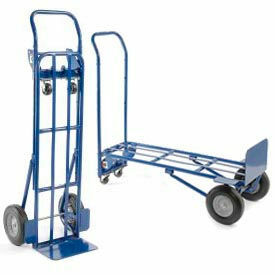 Hand Truck weight capacities are 500, 600, and 800 lbs. Platform Truck weight capacities are 800, 1000, 1200, and 1250. Dimensions vary per model. 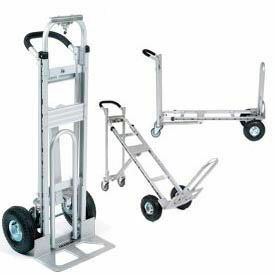 Aluminum 3-in-1 Convertible Hand Trucks combine a Platform Truck and Incline Truck with a Standard Two-Wheel Hand Truck. Aluminum 3-in-1 Convertible Hand Trucks quickly convert from a standard two-wheel Hand Truck to either a 45-degree incline Truck or a four-wheel Platform Truck. Convertible Hand Trucks are made using aluminum for lightweight operation and long lasting durability. All Hand Trucks feature 12"W bed width. 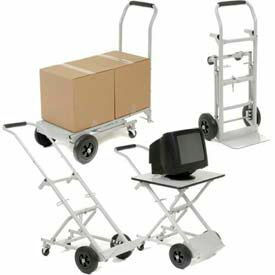 Hand Truck capacities are 500 and 600 lbs. Platform Truck capacities are 750 and 900 lbs. Available wheel types include Microcellular Foam and Pneumatic. Harper™ Ultra Lite Nylon Hand Trucks are Lightweight and as Strong as Aluminum or Steel. Harper™ Ultra Lite Nylon Hand Trucks black nylon frame helps make these Hand Trucks some of the lightest on the market. Ultra Lite Nylon frame is also chemical and corrosion resistant for extra durability. The steel handle and 14-1/2"W x 7"D steel noseplate allow long life. Stair glides are integrated into the frame to help ease movement up and down stairs. Shipped assembled. 1 Year Limited Warranty. 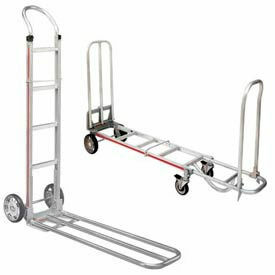 Standard Harper Hand Truck is 48"H and rolls easily on 10" x 3-1/2" full pneumatic wheels. 2-in-1 Convertible Hand Trucks easily convert from a standard Hand Truck to a convenient Platform Truck in seconds. Multi-Cart® Convertible Hand Trucks Transform in 2 Seconds! 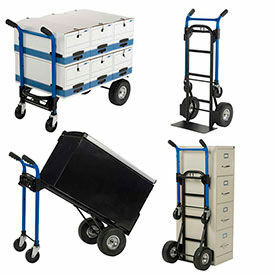 Multi-Cart® Convertible Hand Trucks carry bulky cargo with ease and fold compactly for storage. The lightweight, rugged steel frame with powder coat finish has a non-skid surface that extends in seconds using a quick action release. Hand Trucks also include integral stair climbers. MHT Mini Hand Truck features an 18" folding nose and rolls smoothly with 6" no-flat wheels. 8-in-1 Hand Trucks transform into any of 8 configurations. Trucks have foldable sides that lift and lock into place with handy release cables. Rolls smoothly on 2 swivel with brakes and 2 axle-mounted no-flat rigid wheels. Steel 2-in-1 Convertible Hand Trucks are used for Applications including Commercial, Industrial, Distribution, and more. Steel 2-in-1 Convertible Hand Trucks are made of high quality materials for long lasting durability and dependability. Trucks allow ergonomic content mobility and transport. Removable push handle converts unit from a Hand to a Platform Truck. Includes wheels for convenient maneuverability. Types are Full Pneumatic, Pneumatic, Semi-Pneumatic, and Solid Rubber. 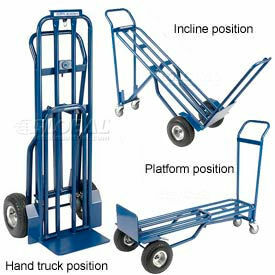 Hand Truck weight capacities are 300, 600, and 800 lbs. Dimensions vary per model. Steel 3-in-1 Convertible Hand Trucks Easily Convert for Customized Needs. Steel 3-in-1 Convertible Hand Trucks have a 45 degree incline position, as well as conventional Hand Truck or Platform Truck positions. Heavy duty Hand Trucks are made with 1" diameter welded tubular steel for maximum durability. Trucks feature a 14"W steel noseplate, and roll smoothly with 8" Solid Rubber or 10" Full Pneumatic Rear Wheels. Hand Trucks with a Folding Nose have a steel extension that flips out to help carry oversized loads. Truck styles are Folding 18" or 29" Nose Extension and No Folding Nose Extension. Hand truck weight capacities are 500 lbs. and 600 lbs. Heights are 44" and 51". Platform truck weight capacities are 500 lbs. and 600 lbs. Bed lengths are 34" and 50-1/2.Bed widths are 13" and 13-1/2". Bed heights are 9" and 43". Rear wheels are 10" full pneumatic or 8" solid rubber. Versatile Multi-Function Hand Trucks easily Convert for a Multitude of Uses. Multi-Function Convertible Hand Trucks are for office use and fold compactly for storage and transport. Easily converts into multiple configurations and fits inside most car trunks. 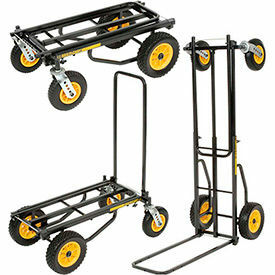 Rolls smoothly with 8" x 1-¾" semi-pneumatic wheels and 2-½" rubber swivel casters. Easy assembly. Snack Route Aluminum Hand Trucks feature Extra Long Nose Plates used for Transporting and Handling Large Cartons and Boxes. Snack Route Aluminum Hand Trucks are made using lightweight aluminum for durability as well as ease of use. Large platform allows easy accommodation of cartons and boxes. 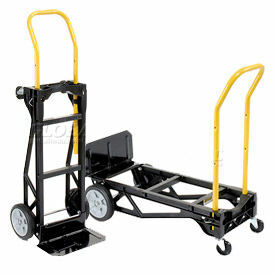 Hand Trucks have a U-loop handle for easy one-handed steering. Available in different sizes with 2 Wheel and 4 Wheel configurations. Vestil Aluminum Hand Truck with Folding Workbench Converts into a worker-friendly Platform in Seconds! 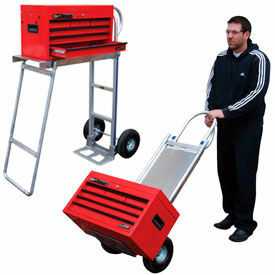 Vestil Aluminum Hand Truck features an integral Work Bench that can be moved where it's needed most. Portable Workbench surface opens to 30"L x 13"W x 40"H providing a comfortable, ergonomically correct working position. The 100 lb. capacity mobile bench folds flat within the Cart in seconds. Welded aluminum frame is strong yet lightweight and the 14"W x 7-1/2" cast aluminum nose plate accepts large loads. Loop style handle offers one-handed steering. Rolls smoothly on 10" full pneumatic tires that offer a 500 lb. capacity. Magliner® Bulk Container Edition Hand Trucks accept a Plastic Container for Hauling Bulk Goods. 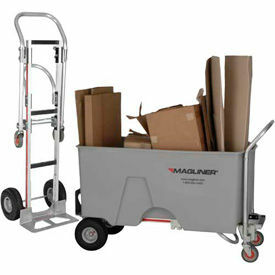 Magliner® Bulk Container Edition Hand Truck provides you with the features of a Hand Truck and a Platform Truck, and is engineered to carry a Magliner® Bulk Container for moving goods in manufacturing facilities, laundries, and mail rooms. Compact, lightweight, high strength aluminum construction is balanced to accommodate high capacity loads throughout your workplace. Just press the release bar and the main frame slides down into the platform style. Extra wide, 18"W x 7-1/2"D beveled aluminum nose plate, non-marring 4-ply 10" x 3-1/2" pneumatic wheels and 5" x 1-1/2" rubber wheel swivel casters. Available in Straight Back and Curved Back frames. 1 Year Limited Warranty. 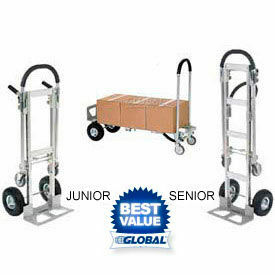 Note: The Gemini Senior Bulk Container Edition Hand Truck is not the standard Magliner® Gemini Convertible Hand Truck. The Container Bin cannot be mounted onto standard Gemini Convertible Hand Trucks. Note: Bulk Container sold separately. Harper™ 4-in-1 Convertible Hand Trucks Provide Easy Conversion From Two Wheel to Four Wheel. These 4-in-1 convertible hand trucks convert in seconds from a two-wheel dolly to a four-wheel 45 degree incline truck or platform truck. Wheel type is Solid Rubber with diameters of 8" or 10". Hand truck capacities are 600 lbs. or 800 lbs. Heights are 47" or 48". Platform truck capacities are 700 lbs. or 900 lbs. Bed lengths are 36" or 40". Bed widths are 13" and 13-1/2". Heights are 9" and 11". Standard 800 lb hand truck has handle height of 48" and adjusts up to 56" high. Wheel fenders protect load. Large 10" solid or pneumatic wheels available.